I wonder how are these calculated? Are there reliable sources of the data? While I can't speak about the specific graph in question, I can explain the process of obtaining an empirical estimate of a forgetting curve. The basic process is (1) collect data; (2) model and graph data. A standard design would involve a set of participants completing an initial learning exercise (e.g., a word list; a set foreign language words with meanings; a set of facts; etc.). Participants would then be given a recognition task to measure proportion of facts remembered (e.g., a recall task; a recognition task, etc.). The recognition task would then be repeated at various intervals (e.g., after a few minutes, a day, a week, a month). You could then graph mean performance (i.e., proportion correct) on the recognition task at each time point (i.e., baseline and various follow-up time points). A typical forgetting curve involves a monotonic reduction in recall over time where the rate of forgetting slows and recall approaches an asymptote. See for example Averell and Heathcote (2011) for discussion of power and exponential functions of forgetting. You could then use the lines of best fit to interpolate points between the measured time points. There is research that looks at the combination of practice and forgetting and the resulting memory consolidation that occurs through spaced practice. See for example Pavlik and Anderson (2005). The general finding is that (a) people forget over time; (b) revision restores recall; (c) forgetting is less after second and subsequent revisions. Thus, the basic idea implied by the graph that spaced revision improves longer term recall is supported by research. The smooth increase shown in the plot is incorrect. Presumably revision would be a relatively short and discrete event (i.e., perhaps 20 minutes) which leads to an abrupt increase in recall. Furthermore, the size of the gains achieved by repeated practice would depend on a range of other factors and may not be as great as implied by the graph. Averell, L., & Heathcote, A. (2011). The form of the forgetting curve and the fate of memories. Journal of Mathematical Psychology, 55(1), 25-35. Pavlik, P. I., & Anderson, J. R. (2005). Practice and Forgetting Effects on Vocabulary Memory: An Activation‐Based Model of the Spacing Effect. Cognitive Science, 29(4), 559-586. 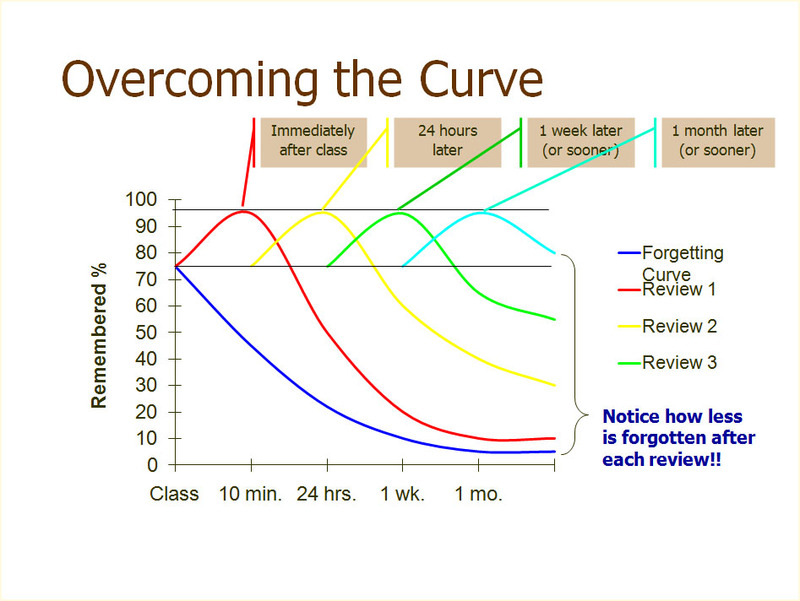 How does the Forgetting curve change after repeated exposure to the same item we would like to memorise? Does typical duration of Short Term Memory differ between tasks? How did Ebbinghaus decide on his number of words in a series?